I met April Cornell when she was a featured speaker at Southern Lady Celebration. Her linens have been on my tables for years. I have collected them and use them constantly. April is the kind of person that when you meet her, you feel as though you have known her for years. Her grace and charm are so inspiring, and hearing what inspires her motivates me to create beautiful surroundings in my home and my office. We both work with our sons in business, and we love beautiful fabrics—a few of the lovely things we have in common. I had an opportunity to learn the deeper story behind April’s business and get a better understanding of her creative passion. A love for nature and a joy in helping others help drive her business. I’m excited to share our conversation with you. I hope it inspires you to be thoughtful and creative and to appreciate the beautiful things that cross your path. 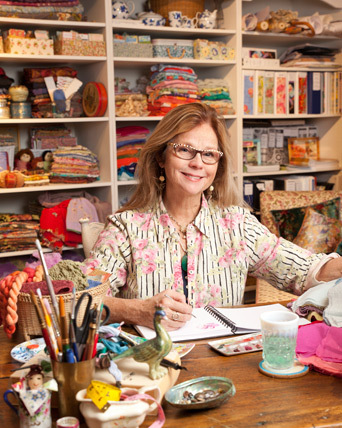 Phyllis: I have marveled at your product offerings and the romantic spirit you capture in each design. What was the first product your company offered and in what year? April: Knitted, brightly patterned socks from Afghanistan. It was 1975, and we brought them in by the sackful—a handwoven sack with big stripes on it, as I recall. We followed those with Afghan nomadic kuchi dresses, embroidered Kandahar wedding shirts, and flat woven Afghan kelims. The first design fashioned on a vintage style was a Victorian blouse, based on an antique I found on Canal Street in New York. That began the foray into fine cottons, eyelets, laces, ruching, pleats, and needlecraft. Then came printing! The flagship April Cornell store in Burlington, Vermont. Phyllis: In celebrating 40 years, is there one time or event that stands out in your mind as a crowning achievement? April: Not really. I have more of a series of memories: sharing the April Cornell culture in different countries, seeing change happen, planting gardens around the world, working across cultures for common good, touching fabrics. I have loved discovering a new colorway and turning it into a print, a woven, an embroidery. I also cherish working in different mediums—brass, iron, ceramics, wools, knits, woods, cottons—everything. I love finding beauty in the commonplace and then making that beauty commonplace and available. Rather than a single event or moment, it’s as though it has all passed in a moment. Phyllis: What best describes you and your company? April: Nonlinear, broad, artistic. We are always striving, evolving, and challenging ourselves! Phyllis: Was there a clear instance when you just knew you should start a business? April: It wasn’t an aha moment, but instead more of a dawning realization that our second-floor shop and unusual purchases, coupled with a growing clientele, was a business. It was a surprise! Phyllis: Your “bringing nature inside” approach is so inspiring. Do you conceptualize every product, or do you have a creative AC team over which you have the final word? April: We have a very hands-on design team and process. There are three of us: Donna Larrabee, Camille Cornell (my daughter-in-law), and myself. We are very much in sync and often complete each other’s design thoughts. When we are working together, with fabrics and swatches, trims and artworks all around us, time passes in a second. It is truly a high that I have enjoyed for many years. And being in nature always brings rewards, both personally and in design. The turning leaf, the full-blown rose, the tiny bee as it alights, hollyhocks up a garden wall, the pinecones large and small, chickadees—they all are like helpers as we design. 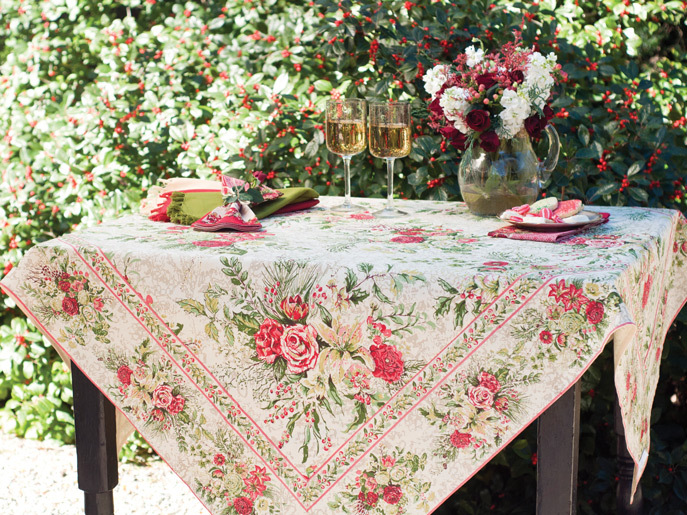 The Merry Tablecloth from April Cornell’s Fall 2015 Joyful Christmas Collection. Phyllis: Your table linens are perfectly coordinated. Do you do the original artwork for the linens? April: I do some of the original artwork—primarily those derived from watercolor. All of our prints are artwork, but it is a collaboration between our designers and our Indian art department that makes our design stand out, connecting the technical aspect of color separations, repeats, and screen making with the original concept. 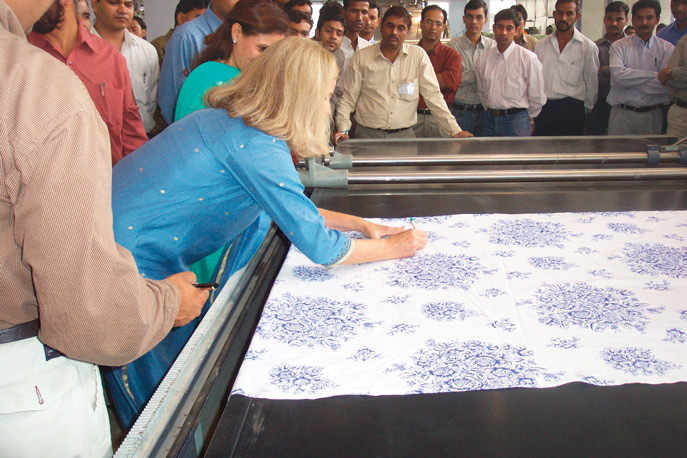 Many of our prints are still screened by hand in a traditional manner. We also do individual artwork for the center of a cloth, a border; another for a mat, a napkin, a cushion. Each is meticulously conceived and rendered. This is unusual. Most designers repeat a single artwork over many items. Phyllis: What differentiates your products from others? April: I think it starts with the vision, which is artistic—not graphic, not purposeful, but beauty based. We design to delight, add richness, and make people’s lives more joyful. Then, we layer in details, tailoring, pleating, pin tucking, and embroidery. We do hundreds of details—from simple satin stitches to French knots to appliqués. We add laces and crochets, combine different prints, and base fabrics to add richness. So in the end, all the layers of technique make something very special to be valued, loved, kept, and shared, and to make our customers also feel valued and loved. Phyllis: Tell me about your foundation and the charitable work you do. April: The Giving World Foundation, the American side of our foundation, is how we give back in areas where we have received so much. We primarily fund programs in India through a foundation called Concern India. With schools for first generation learners and the blind and handicapped, as well as social centers for aging beggars, projects in prisons, and organic farming, Concern India focuses on giving a hand up (not a handout) to those in need. We also support Doctors Without Borders. It is a privilege to be a giver and to know the good-hearted people at the center of these projects as they make a difference. It is indeed a reason in itself to be in business. April working on a block print during a visit to India. Phyllis: What made you choose India as your manufacturing location? How many people do you employ? In how many countries are your sales? April: We sell the April Cornell line in Canada, the United States, and India. We have a factory in India where we employ 350 people. Even though it is an industrial area, we work to bring femininity, beauty, and nature to our headquarters. It is painted pink and fronted with iron gates and a green garden. We have planted flowering trees and maintain a green verge on the road. In Canada, we also have a small headquarters in Montreal. 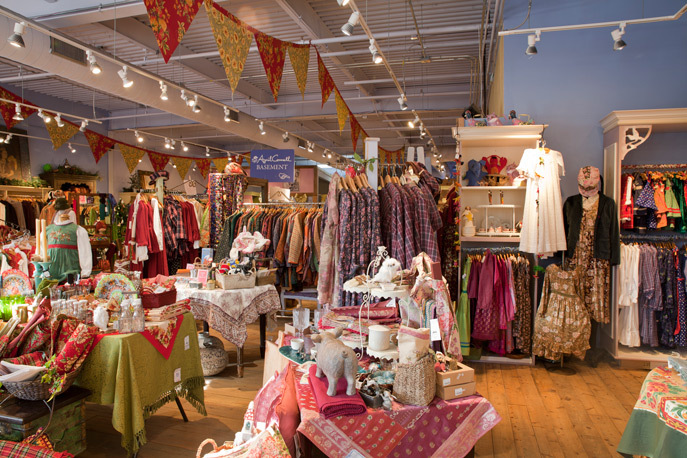 And in the U.S., we are headquartered on Lake Champlain in Burlington, Vermont, where our flagship store remains in a repurposed industrial building painted yellow, pink, and lavender. Phyllis: Your sons are in the business with you. Have they grown up in the business, and what are their present roles? April: They truly have grown up in the business. Sometimes they refer to the business as their sister. She was always present, always important, always cared for and respected. Still is, I guess! Each of my three sons is involved in different ways. Two of them—Lee and Kelly—have started their own menswear lines. Lee created One World Brothers, which has more of a California look, and Kelly started a men’s shirt and accessory line called Seaton Cornell. Both show the design sensibility they absorbed growing up, especially a knowledge of textiles and details, and their work reflects their love of India, where they also manufacture. It’s a place that inspires them and offers them comfort. My sons also help with our retail coordination and with PR. My oldest son, Cameron, writes all of our online and catalog copy. He’s brilliant, and he runs an April Cornell store with his wife in the tiny, interesting town of Ocean Grove, New Jersey. Both of my daughters-in-law are involved in the business through design and buying. A young Lee and Kelly Cornell with their mother in India. Phyllis: Tell us about April Cornell—your life, your loves, and what inspires you to create. April: My biggest love: my guy, Basil Stetson. We were married three years ago and made a pact to make each other laugh every day. We are doing a pretty good job. Being married later helps you count your good luck and the preciousness of each day. As for what makes my heart beat, my mind pause, and my hand begin to paint? What makes me look harder, probe deeper, want more? For that I turn to the natural world in all its awesome beauty. Nature keeps teaching me and keeps me interested. For me, art is a chance to share nature’s expression of grace. The floral print on one of our blouses becomes part of that expression on a daily, ordinary basis. All of these things connect—an artistic expression of nature through a colorful fabric reaches women through our business. Those women, then, influence everything around them and pass on that heartfelt message of natural beauty. I would love to know who the designer is for the footwear used in her most recent fall catalog. Woyld love to purchase but the footwear isn’t mentioned. Please send me your exact criteria in the below mentioned format, So that I can run counts and get back to you with samples and benefits for your review. List suitable for: Direct Mailing, Email Marketing, Tele Marketing, and Fax Marketing. Our list includes: Name, Job title, Company Name, Permission Based E-mail address, Contact number, Physical address and many more. Look forward to your response. Thank you so much for reading my email even in your busy schedule. If you’re not interested please reply subject line as “Leave Out”. Wow, April sounds like a wonderful, smart and inspiring woman, I have always adored anything from her brand and cherish my table linens I purchased soon after I was married and discovered an April Cornell store in Portland, OR. She hits the nail on the head that bringing nature’s beauty to the every day and to women just keeps it continuing. I just bought a dusty pink rose print table cloth for an old red toile china table setting for Feb and spring, I’m so excited by something so simple and pretty and partially because it is “everyday” and not too fancy or pretentious. April Cornell, thank you for doing what you do and I hope your legacy continues for a long time! Love all things April Cornell! Thanks so much for sharing. Thank you for sharing this true and beautiful life story! Claire. PS: I love the picture too. I really enjoyed reading this. I have several April Cornell table linens and placemats and I love them all! thanks Phyllis! I have loved April Cornell always!!! The designs are precious!! I am so grateful and feel blessed to have some of her linens and clothing ….thanks April ..Happy 40th . she is so very special. With all the choice one has she is outstanding, The Quality is great. The April Cornell products demonstrate the softness and loveliness to be seen in our world. The beauty of our world serves to remind us of our Creator…Who loved us so much He created a beautiful place for us to live in and blessed us with our own “uniqueness”…our own gift of creativity to share with the world that no one else can contribute…making us each loved and valued by Him. If we just quiet our busy lives…open our eyes, our ears and our hearts to receive…we will fulfill what we were designed to give…for “such a time as this”…and we will, hopefully, encourage others to know that they have gifts of value to share, also. We can be carriers of the Light that can push back darkness so that others…especially our youth…can see the beauty of our world and know it’s Creator, too. Thank you for showing us the beauty that you see in the world, Phyllis, and for introducing us to others who see and share the beauty, also! This entry brought tears to my eyes. It was an answer to my prayers. Thank you so much for your testimony!! Beautifully written. God bless you & Thank You!!!! One of my most favorite outfits I bought for my granddaughter when she was a little one was an April Cornell Pinafore and beautiful white lawn undergarment. She always wore it with a pair of heavy hiking boots (!) and looked absolutely darling! Thank you, April! I have a couple items of clothing and I particularly love the fine, thin delicate Indian cottons, with the beautiful embroidery. I have a favorite nightgown which also has a crocheted lace edging. Please don’t stop your fine work! We had a store in our town and then it had to close suddenly. There was a shopping frenzy, and I bought many linens and some great clothing items. Everything had to go, lock, stock, and barrel. It’s a good thing I didn’t discover April Cornell when my daughter was small or I would have bought out the store! Love the catalogs, and even the product names. 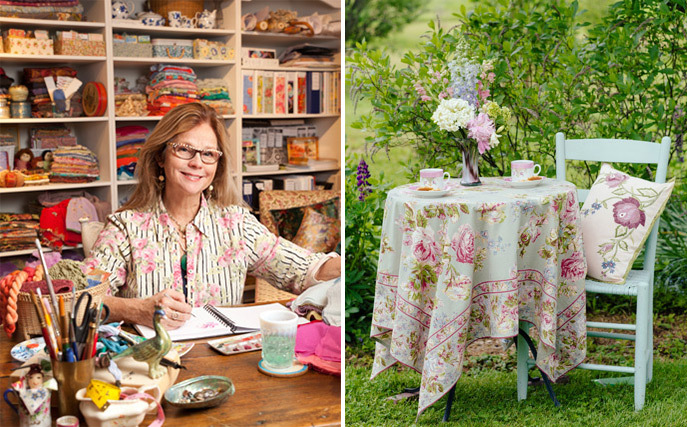 How very interesting to know a bit about the lovely lady behind the lovely linens. Beautiful textiles in most any form inspire me — white on white delicate hankies to wonderful tapestries. Just yesterday as I made the mistake of walking near the department store fabric center, I saw fabric that just HAD to become a tablecloth & napkins. Actually similar in design to that gorgeous tablecloth in the article, the hand of the fabric isn’t the quality I usuall buy; but, the pattern was too pretty to left behind. Of couse now I want the AC one also!! I love April Cornell’s designs, but I wish she would produce her square tablecloths in a larger size as her standard 52″x52″ are too small for my 54″ table. Thank you for sharing April’s story. I have a set of placemats that are absolutely my favorite, even my husband commented that he liked the placemats when I brought them home! How exciting to know about their store in Ocean Grove, NJ. I will be sure to make that trip soon!!! Thank you again Phyllis. Thank you for sharing the inspiring story of April Cornell. I also have a collection of her linens and treasure each one of them. It was great to hear of all the charitable work her family is doing as well. I love April Cornell products. I remember my first exposure and purchase. Thank you, Phyllis, for sharing this delightful and inspiring interview.